Rai lay Beach is definitely one of the most beautiful and spectacular beaches in the world. My wife and I went there during Chinese New Year, as our "honeymoon". Even though it is on the mainland, the only way to get there is by longtail boat from Krabi. That's because the beach is surrounded by such tall, steep cliffs that there is no other way to get there. You have to negotiate a little with the boatman, but prices seem pretty much set. There are two parts to the peninsula it sits on- the resort side, and the backpacker side. The longtail boat takes you to the backpacker side, which fronts on a mangrove swamp. Not the kind of beach you went there for, but that's OK. The accommodation is cheaper, (about 600 or 700 Baht a night), and since there is no barrier between the resort and backpacker sides, you stay and eat at the cheaper backpacker side, and go to the beaches at the luxurious resort side. The only difference is you will spend at least twice as much for a fancier and maybe more comfortable place to sleep if you stay at one of the resorts. If you really want to go on the cheap, you can walk over or around the rocks to Tonsai beach, and get yourself a hut for around 350 Baht. If you do, don't expect anything other than the most rudimentary accommodation. But since the huts are really out of the way, they are pretty peaceful. Tonsai is where they do all the rock climbing and base jumping off the cliffs. There is plenty to do at Railay and Tonsai besides swimming and working on your tan. My wife had always wanted to see a cave, and there were plenty of them for us to explore. You can go island hopping, snorkeling, scuba diving, fishing, sea kayaking, jungle trekking, (you can even go by elephant if you want), and of course rock climbing and base jumping. 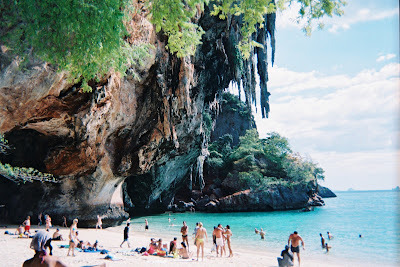 We checked out Ao Nang beach, and while it is very popular, it was too touristy for our taste. Railay and Tonsai are definitely places to check out if you plan to go to Phuket. As for me, I liked them better than Phuket, because there are no girly bars and really loud tourist traps in Railay and Tonsai.